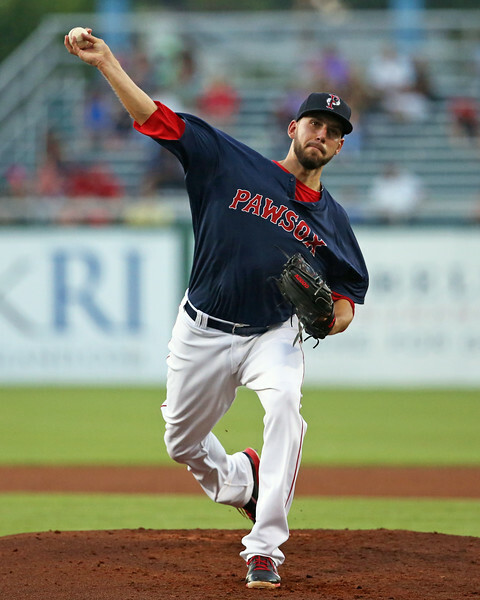 In this edition of The Write-Up, Chaz Fiorino provides a detailed scouting look at SoxProspects #11 prospect Matt Barnes. Stat line: 7 IP, 7 H, 5 ER, 0 BB, 10 K, 102-73 Pitches-Strikes. 15/28 first-pitch strikes. 16 swing-and-misses. Physical Description: Athletic, strong, durable frame. Long legs, high waist. Not much room for physical growth. Arm/Delivery Mechanics: – Three-quarters arm slot. Worked from middle of the rubber. Hands set at the belt. Brought hands to chest with first move towards the plate. Long arm action in back with a slight wrist turn. Great balance over the rubber on back leg. High leg kick with average extension towards the plate. Stayed on line consistently and pitched downhill. Comments: 88-92 mph in the first inning and early in counts. Sat 91-94 in later innings. 94-96 when he got in trouble or wanted it late in counts. Pitch has arm-side run when down in the zone. The ball jumped out of his hand and got on hitters quick. The pitch was heavy, overpowering at times. Pitch got flat when he left it up and when he elevated it with two strikes by design. Had above-average control and command this outing, pitching to both sides of the plate. Comments: Had late, hard snap out of the zone. Solid-average when he stayed through it, and flashed plus on numerous occasions. Tough to command; average control. Pitch had a chance to be a legitimate plus offering with improved consistency and command. Comments: Showed feel for the pitch. Used it often enough to keep hitters guessing. Maintained arm speed. Average control. Tended to leave it up in the zone. Needs to improve command down in the zone. Summation: Made a mistake pitch to Nationals prospect Michael Taylor in the first inning, leaving an 88 mph fastball up over the heart of the plate in a 0-1 count. Taylor had no problem turning on the pitch and pulling it to left for a solo home run. When Barnes got in trouble, needed a strikeout, and knew he was approaching the end of his outing, he had no problem reaching back for 95-96. The fastball basically played as two different pitches because of the varying velocity ranges. When Barnes wanted it, the fastball was overpowering and exploded on hitters. Early in the game and early in counts, he was comfortable working in the 89-93 range. Barnes was able to repeat his delivery and stay online much better than the last time I saw him, most likely a result of not pitching max effort all outing this time around. Mechanically, he came set with his hands at the chest when I saw him back in early July. This outing, he started his hands at the belt and made a slight move, bringing his glove and hands back to his chest as a first move in the delivery. Barnes has made significant improvements in his control over the second half of the year. Dating back to July 22, Barnes has put together 46 2/3 innings with 44 strikeouts, 12 walks, 2.33 BB/9, 3.66 K/BB and 8.57 K/9. Barnes’ most impressive showing of the night was a fifth-inning battle with Taylor. Taylor came to the plate with bases loaded and worked a 3-0 count to start the at-bat. With his next pitch, Barnes spotted a fastball at 95 mph perfectly on the inside corner for a called strike. He then spotted a 96 mph fastball up-and-in that Taylor chased for a swinging strike. With the count full, Barnes spotted a 96 mph fastball perfectly on the outside corner to strike Taylor out looking. The sequence shows that Barnes’ fastball can play well above-average when he needs it. The curveball continued to flash plus potential and lack consistency as seen in the past. The changeup was a serviceable third offering that grades average at best. Barnes got beat on his changeup in the fifth inning by prospect Steven Souza. With the count 2-1, Barnes made a mistake, leaving a changeup up over the plate that Souza drove to left field for a two-run, go-ahead double. Souza had been struggling with the fastball all night and Barnes should have stuck with his own strengths or tried to get Souza to chase the curveball in a 2-1 count with runners on second and third. The two plus-pitch combo has led some to project Barnes as a future star in the back end of a bullpen. Still only 24 years old, I would continue to give Barnes every chance to continue developing in the rotation, because he could be a solid middle-to-back end type starter. Improved consistency with the curveball and locating it within the zone will be a huge factor in reaching his ceiling, along with maintaining the consistency and overall control Barnes has demonstrated over the course of the second half of this year.